Difference between CF, KF, and ISO Flanges- Vacuum Pump - EVP Vacuum Solution! 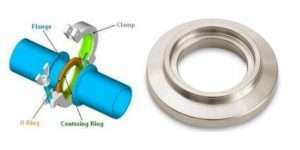 Flange connections are widely used in the connection of vacuum units, such as vacuum pumps and pipes, valves, cold traps. Commonly, there are three types of them: CF, KF and ISO. What are differences between them? CF is the abbreviation for Conflat Flange. It is a static metal seal. 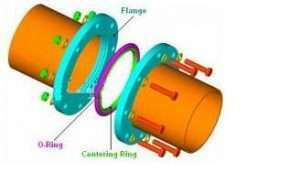 Sealing material is usually Viton, PTFE, and oxygen-free copper. Flange material is generally SS304, SS316, etc. It can withstand high temperature baking, and the applicable vacuum degree is up to 10-12 mbar, common calibers include: DN16, 40, 63, 100, 160, 200, 250, etc. 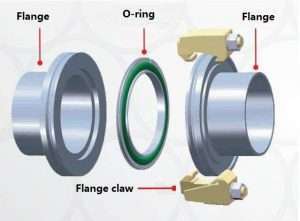 KF is a quick-release flange, easy to disassemble, the main components are: flange, seal ring, centering bracket, clamp. Seal material is usually Viton, Buna, Silicone, EPDM, aluminum, etc. Flange material is generally SS304, SS316, etc., and can withstand high temperature baking, the applicable vacuum degree up to 10-8 mbar, common caliber includes: DN 10, 16, 25, 40, 50, etc. a. ISO-K vacuum fittings usually consist of a flange, a clamp, an O-Ring, and a centering ring. See below picture for your reference. b. ISO-F vacuum fittings usually consist of a flange, an O-Ring, and a centering ring. Unlike ISO-K, flanges are sturdy with bolts. See below picture for your reference.